Sacred Light Pty Ltd, 9780648011507, 216pp. If you've ever experienced a synchronicity, lucky break, act of grace or soul mate connection then you've experienced an everyday miracle--and chances are you created it. The art is creating them more often. Silvana La Pegna, medical intuitive, coach and mentor has dedicated over a decade to understanding and teaching her clients how they can apply self-help to heal themselves and transform their lives. When working as a medical intuitive she used her intuition to detect disharmony in the energy fields of her clients and uses this knowledge to teach them how to shift unhelpful vibrational frequencies to improve their health and life experiences. She explains many miracles are deliberate acts of co-creation that allow you to attract what you want or need when you know how. She believes that everything has a vibrational frequency; everything you believe, think, do and say sends invisible signals to everyone around you and vice versa. She has coached hundreds of clients on how to create and maintain the optimal mindset and apply spirituality in practical ways that invites and allows everyday miracles to show up. She shares 7 self-transformation keys to unlock our miracle-making mindset and shows us how these keys can shift our vibrational frequencies to improve our mind, body and spiritual wellbeing to accomplish what we want most. 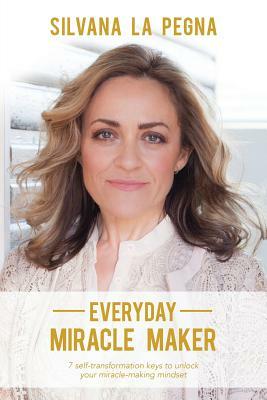 Everyday Miracle Maker clearly explains how our beliefs, thoughts, actions and language dictate whether we are aligned with accomplishing our soul's desires or whether they are getting in the way.